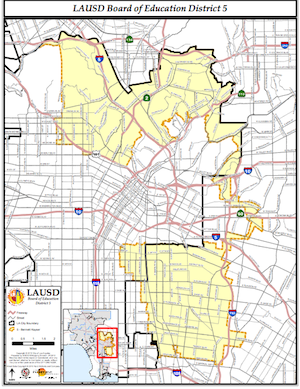 LA Unified’s school board District 5, runs a tortured, ear-muff-shaped path from Los Feliz in the north, following a narrow band south, and expanding in the south to Lynwood. Along the way it reaches parts of Echo Park, Vernon, Maywood, Huntington Park, Bell and South Gate. With an Hispanic population of 74 percent, District 5 was originally carved in 1978 as a Latino seat, but has only been held by an Hispanic school board member four of the last 15 years. The district includes the newish $239-million Sonia M. Sotomayor Learning Academies, as well as Jefferson High, focus of the recent troubled computer overhaul known as MiSiS. The district is home to 37 charters, including US News ranked Alliance Marc & Eva Stern Math And Science. In all, there are 120 elementary schools, 42 middle schools and 41 high schools in LAUSD’s District 5. (See list here). Three candidates are vying for this seat. A former middle school science and health teacher, Bennett Kayser was first elected to represent District 5 in 2011 in a narrowly won race with help of $1.4 million spent by the teachers union super PAC. He is considered one of the teacher’s union staunchest allies on the board. Although Kayser and his wife co-founded of one of the district’s earliest charter schools, over the years he’s become reliably anti-charter, voting against new applications and renewals at nearly every opportunity. He was also a relentless critic of the reform policies of former superintendent John Deasy. Kayser had to recuse himself on some of the votes regarding the controversial iPad initiative because of a conflict of interest involving his ownership of Apple Inc. stock. In his re-election bid he has once again won the support of the teachers union, which is spending big money to defend his seat while the California Charter School Association PAC has spent even more to ensure his defeat. As a result, Kayser has been the target of some odd and arguably racist ads. Bennett Kayser declined to speak LA School Report about the election. League of Women Voters Questionnaire: What is the single most important issue facing LAUSD today? Did not respond. He’s also an adjunct professor in the School of Education at his alma mater, Loyola Marymount University. Most recently, he was appointed by Governor Brown to serve on the California Commission for Teacher Credentialing. The California Charter Schools Association has bestowed upon him the crown of ed reform darling this election, footing the bill for more than a half million dollars worth of campaign flyers, phone calls and canvassing on his behalf. If he is successful in unseating incumbent Bennett Kayser, the balance of power on the board would shift from a majority pro-union to a pro-charter one. League of Women Voters Questionnaire: What is the single most important issue facing LAUSD today? The most important issue facing the LAUSD is its failure to help the 30% of students who aren’t graduating from High School. Full answers here. Andrew Thomas is a professor of education at the online Walden University and operator of a research company that consults with school districts, including LA Unified. Thomas has two children attending LA Unified schools, and throughout his campaign has pitched himself to voters as the missing “voice of parents” on the school board. In several debates he’s faulted the current board, including incumbent Bennett Kayser, for mishandling of the iPads and MiSiS programs. Thomas argues for the need to retain greater job protections for teachers. His position on charter schools is pragmatic; he acknowledges the negative fiscal impact of charter schools on the district, but says the district must learn to contract to deal with the inevitable loss of revenue.